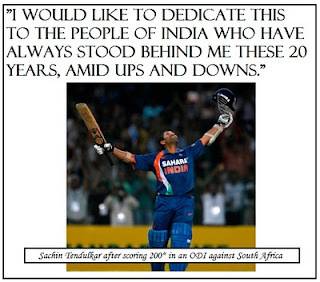 England Test captain Andrew Strauss has saluted India icon Sachin Tendulkar as the legendary batsman prepares to chase his 100th international hundred in the forthcoming series between the sides. Tendulkar has notched 51 Test and 48 one-day centuries and Strauss believes there are few signs of the 38-year-old Indian's powers diminishing. Strauss will get a look at Tendulkar's current form over the next few days as the Middlesex batsman is on a loan spell with Somerset -- in a bid to end his run of low scores -- and will play in their match against the tourists at Taunton. "It goes without saying that it is a phenomenal achievement, not just the fact he scored those runs, but his desire and motivation to play that long and keep chasing down those records," Strauss said. "He seems to be playing as well as ever at the moment. It is a great example for us all that if you are still hungry, there is no reason why your powers should decline as you get older. "He has been one of the great players over the last 20 years and I'm sure he will want to have a big series. "Technically he is fantastic, his mental strength to bat under that amount of pressure for all that time is fantastic. "He is a very dignified and humble man as well. If there are good examples out there, he is probably the best of them." However, Strauss is hoping England paceman Chris Tremlett can make life uncomfortable for Tendulkar and his team-mates in the first Test at Lord's next week. "Are India susceptible to short deliveries? I think all the sub-continent sides have got better at that in recent years," Strauss said. "It comes as a result of touring here quite often. Certainly their senior players are no strangers to these shores. "We are not expecting any dramatic weaknesses there but we know someone like Chris Tremlett performed very well against them last time around here. "He was a lot younger and probably less developed as a bowler then. "I think we saw against Australia and Sri Lanka, that type of bowling, if done consistently and accurately, will trouble most people."